We pride ourselves on providing top quality repairs. One way we ensure this is to have state of the art repair and testing facilities. We are an active member of EASA (Electrical Apparatus Service Association) and follow all EASA quality and warranty standards. Replacement parts can be expensive. That's where we can save you money. Our highly trained, experienced machinists and welders are experts at repairing expensive items such as shafts, housings, and other major components. We can even "reverse engineer" many parts that may be obsolete or hard to find. Our extensive array of equipment includes multiple lathes capable of up to 36' dia. x 10' components, high capacity milling machines able to process material up to 48' dia., a 200-ton horizontal press, Mig, Tig, and the latest technology metal spray welding equipment round out our heavy equipment. 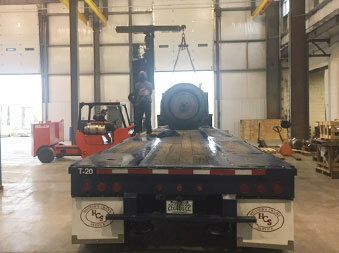 A 5,000-pound dynamic balance machine ensures your equipment will operate well within established vibration limits. 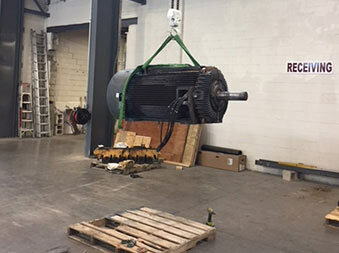 Have a large motor that needs repair? Our expanded facility gives us the capability to work on equipment weighing up to 15 tons, and the dual overhead crane gives us 25 ft. under the hook. Two Milling Machines up to 36"